The Munda of India by tradition do cultivation and today many are agricultural workers. They are not vegetarians but they do not eat beef. Rice is their main cereal. They have community councils to judge in local matters. Many of them are Hindus. The Munda worship their ancestors and nature also. In West Bengal the Munda are also called Manki. They do basket work and weaving. In addition to their own language, they speak Hindi and other languages. In Orissa, the Munda speak Mundari and Oriya. Those who are educated are in office work. 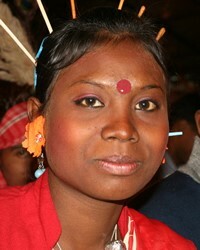 The Munda in Tripura are also called Mura. They have a low literacy level, so the gospel needs to be given in oral form there. They do family planning. In Madhya Pradesh the Munda are also called Mudas. They speak Sadri. They favor cross-cousin marriages. Burials are for children and cremation is for older people. They collect wood and products from the forest to sell. Their children have an education, unlike some groups. In Assam the most usual way for the Munda to marry is by agreement. Divorce can be difficult to get. On the death of the father, sons inherit the property and the oldest son becomes in charge of the home. The Munda there work as laborers in tea gardens. In the tea gardens most of the young are Christians. The Munda have a lot of deities, with Sing Bonga being their main one. Family planning is not favored there. * Pray that God will give the Munda dreams and visions leading them to Salvation. * Pray that the Munda Christians will lead the others in their group to Jesus Christ. Singh, K. S., ed. 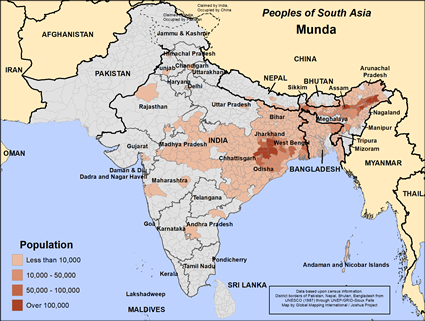 "India's Communities A-Z", Oxford University Press, USA 1999View Munda in all countries.